God hears us when we call out to Him. Psalms 138:3 “On the day I called, You answered me; You increased strength within me.” Thankful! My friend M. had her trial this week and it wasn’t the worst outcome, but it wasn’t the best. Thank you for praying because God gave me the opportunity to speak with her and share with her the hope she can have in Jesus. We are so excited about Thanksgiving, which we will celebrate on Saturday with a mixed group of believers and non-believers. God would continue to open M.’s heart to her sin and need for a relationship with Jesus. God’s presence would be evident during our Thanksgiving celebration and that those who are not Christians would see this and want to know more. Sophia would be encouraged and able to be caught up with her school assignments without any stress. We would give God our full attention each day and not be distracted from the most important things. At the beginning of October, I traveled to Prague, Czech Republic to meet with other journeymen on the field. The time was refreshing and eye opening in many different ways. I am so thankful for the friends I have met on this journey. We were able to reflect over our last year on the field, pray over one another, and encourage each other. Since arriving home from Prague, I have been very busy with students. On October 27-28 I had a sleepover at my house. There were 5 girls who came. In Hungary, it is very uncommon to stay the night at another person’s house unless they are family. This was an experience that some of the girls had never had. We did hair, make-up, nails, watched movies, made crafts, ate lots of pizza, and played many games. Some of the girls went to sleep around 4 am. However one girl stayed awake all night, so I stayed up with her! I am not cut out for all-nighters any more! Haha. I am going through some things that have been disheartening lately. I have had lots of encouragement from family and friends that has been helpful. Pray that Satan will stop using these things against me and I can focus on what I am here to do. As you know, Thanksgiving is coming soon. I am going to make a Thanksgiving meal to go have at Bible Study on Nov. 24th. Pray that all goes smoothly with it, that the students enjoy it, and that I can clearly share the gospel and the reason to celebrate. As the holiday season begins, pray that I wouldn’t struggle being away from family. Last year wasn’t as bad as I thought it would be. Pray that I would have peace during these times and that missing home won’t become too big of a distraction. I have not been sleeping well. I tend to be tired during the days and as soon as my head hits the pillow, I’m wide awake. Pray that I would begin sleeping better. Pray for “G.” She was asking lots of questions and I was getting excited talking to her about spiritual things. Recently, she has been put off by anything to do with God. She doesn’t pay attention during Bible Study and has started to be a little disruptive as well. Pray that God would grab hold of her heart and that she would come to understand the love and grace that He has for her. December 3-10: Week of Prayer for International Missions. December 10 is the LMCO official Sunday. Our national goal this year is $160 million. Your giving enables missionaries to be sent to make disciples and multiply churches among unreached people and places for the glory of God. For more information on LMCO you can go to imb.org. Greetings from Bonham, and welcome new prayer partners! We just love Thanksgiving and the opportunity to focus on who and what we are thankful for. It has been crazy these last two weeks but we have been blessed by meeting some incredible people. Yesterday as we were on our way home passing through Springfield, Missouri, we decided to drop in at the Old Navy to do some Black Friday shopping. The Lord allowed us to see two friends of ours, one of which was our friend/colleague that we were praying for, who had brain surgery a few weeks ago. We also got to visit with his daughters who we haven’t seen in a while, in the middle of Old Navy. Another was a friend of Arianna’s from the youth group from our home church. It was a good reminder of how God is at work around us and His timing his perfect. God would give us peace and diligence to get caught up with school. You can pray especially for Abigail and Sophia since we have not been able to do as much while traveling. Divine appointments as we will meet with some international students on Monday night at a dinner. Pray that we will be able to have spiritual conversations that would encourage them to follow Jesus. Ezra (my sister’s son who has Krabbe disease) has had a pretty difficult week. Pray for the parents Karlita and Ryan as they face a unknown future about how this disease is already effecting their baby. The chemo is finished and the stem cell procedure was completed and now it is time to wait. Asking God to heal him. Pray for our friend and colleague who had brain surgery. They are now in the states with family. Pray for his wife and their children, as he faces radiation and chemo and they are hoping for the best prognosis. Ask that God’s peace would continue to rule their hearts and minds. The students in Debrecen, Hungary who participated in our Thanksgiving celebrations last year, that they would remember and desire to know more about Jesus, the reason that we are thankful. There were so many Hungarian and international students and families that joined us. God’s spirit would continue to draw them. 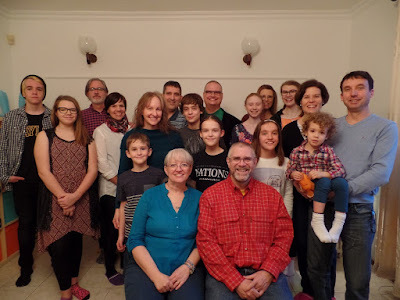 Praise the Lord for how He meets our every need and beyond, and for the family He gives us when we are missing those back home in the U.S. Pray that we will always keep a thankful heart no matter what circumstances arise. It gives glory to God, keeps us from becoming discouraged, and is a witness to the people around us that the joy of the Lord is not dependent on the crazy ups and downs of life.